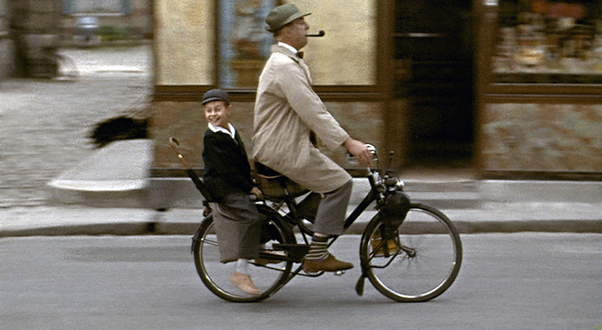 “Mon Oncle” Is French filmmaker Jacques Tati’s 1958 comedy and his second of four films featuring his Monsieur Hulot character. The acclaimed director only had six feature-length films to his credit and this was his first in color. It’s also a widely appreciated picture that earned Tati an Academy Award for Best Foreign Language Film. There are several themes that Tati plays with in what’s an otherwise playful comedy. He satires materialism and the lust for things. He shows the sterile and artificial relationships of those absorbed with social status. These and other things are certainly interwoven within the story, but for me the movie is more effective as a fun and often times charming comedy. 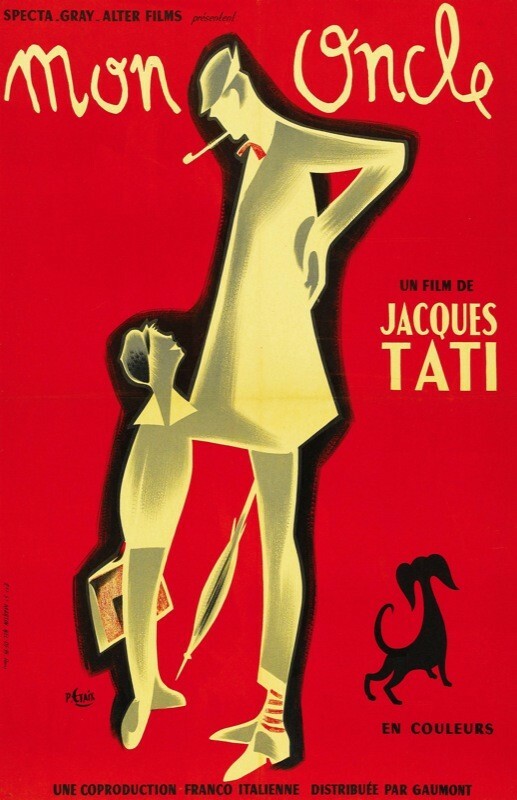 Tati not only directed, produced, and co-wrote “Mon Oncle”, he starred in it as well. His Monsieur Hulot character is as lovable as he is inept. He’s an awkward and almost child-like character who views life with a smile, a bow, and a tip of his hat. Hulot lives in an energetic working class neighborhood in Paris filled with older buildings and busy streets. For me the very best part of this film is the time we spend in this close-knit community. Tati does a wonderful job of familiarizing us with the places and the people who make up Hulot’s lively neighborhood. There’s the lovely young girl from his building who always greets him with a smile and sometimes sweets. There’s the short cranky produce man whose tools fall out of his truck whenever he opens his door. There’s the friendly street sweeper who spends more time talking than sweeping. There’s the group of men who spend most of their time at the Chez Margot cafe. These are just a few of the people who give this community its beautiful life and character. In stark contrast you have the wealthy upscale suburb which is where Hulet’s sister and brother-in-law Monsieur and Madame Arpel live. Their modern, high-tech home is as cold and sterile as an operating room, a description that also fits their relationship. Their true joy is in showing off their house to their more important visitors. There is a reoccurring joke that has Madame Arpel running to turn on a hideous metallic fish fountain in their front garden whenever a truly important guest shows up. It’s all about appearance and self-importance with the Arpel’s. But their young son Gerard feels trapped inside the monotonous walls of the Arpel estate. That’s why he loves it when his Uncle Hulot comes to visit. Gerard loves going back to Hulot’s neighborhood to enjoy the vibrant atmosphere and especially to play with his mischievous friends. Some of the film’s funniest moments involve these little pranksters pulling all sorts of practical jokes on passersby. Hulot, in many ways a child himself, really doesn’t try to control them. He just reacts to them as he does everything else – no harm, no foul. Gerard’s affection for his uncle doesn’t make Monsieur Arpel very happy. He is jealous of the relationship even though he doesn’t invest any time in Gerard. He also looks down on Hulot as his inferior. Madame Arpel believes she can change all of that by introducing Hulot to their social circle, an idea that’s doomed (and hilarious) right from the start. For the most part “Mon Oncle” is a visual comedy with very little understandable dialogue. Often times we hear the unintelligible voices of the people but it’s plenty to let us know what’s happening. The dialogue that is there is strategically placed and works perfectly within the confines of the story. The bulk of the story is told through nods, gestures, and mannerisms and the humor depends more on slick and subtle sight gags than normal straightforward jokes. All of this contributes to the sheer genius of this movie. Tati incorporates some methods taken from the great silent films both is his direction but especially in his acting. I adore the Monsieur Hulot character. I love watching him tip his fedora and tap his pipe on the bottom of his shoe. I love his happiness and contentment that is ever-present even though he lacks the material possessions that others crave. I love his innocent naivety about the modern world and I love his playful relationship with his nephew. He’s such an endearing character and he’s the perfect model for Tati’s ‘man versus modern technological’ concern. It’s not just the good humor and great characters that make this movie so good. There’s also Tati’s amazing visual technique. He uses the camera like a pair of eyes just watching and taking in what his characters are doing. This is what gives “Mon Oncle” it’s undeniable life and vibrancy. Tati never shortchanges any detail and as a result I felt I was right there walking through the neighborhood square and watching the same five little dogs pop up throughout the movie. This is made all the sweeter after getting a taste of the Arpel’s cold and impersonal home. The contrast is huge but it’s that kind of connection that makes the characters so dear and the humor so effective. And that’s what makes “Mon Oncle” such a classic. This entry was posted in Classic Movie Spotlight, Movie Reviews - M. Bookmark the permalink. Nice review Keith! Sounds very good indeed. I find French comedy a little offbeat for my tastes usually but this sounds decent. Appreciate it! It’s definitely offbeat and it has its own particular style. But I adore Tati’s work. He clearly admired the silent comedy masters but he carefully incorporates sound into many aspects of this film. It’s visual comedy and I find it to be mesmerizing as well as hilarious. I hope you’ll check it out. No way! Fantastic! Hope it works out for you guys. We are hoping for a return trip next summer. Anyway keep me posted! Well, hope it happens. We’re thinking of going to Amsterdam, Bruges and Paris, seems doable as we only have 9 days. Mother great review bro. This sounds absolutely superb. Something that I think I will thoroughly enjoy. It’s on my list. Cheers man! Subtlety was never a strength! Awesome review, Keith! You’ve really sold me on this one. It’s great. But the best Tati film is yet to come. I’ll be posting its review shortly.